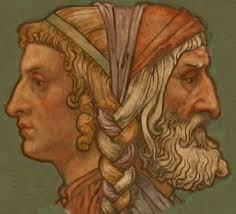 The turn of the year is Janus-faced. We look forward as we look back, loathe to part with the past, yet eager to imagine the future. The poem below, from my book Moving House (2009), was written nearly a decade ago to express my ambivalence about a particular year in my life. But as I revisit it today, I realize it might be true of any year in any one's life. I offer it today as a meditation--on all we leave behind, on all we will receive--a felt moment at a still point in eternity. so much stuff bobbing in our wake. the same old song no more. with effort that was once used to ease. A lonesome occupation and a true. the glad sacrifice, the accomplishment of gain.